SmartPak Equine announced today that it has partnered with Nutramax Laboratories, Inc. to manufacture a special version of Cosequin targeted to the horse in intensive training and competition. The new formula, called Cosequin "SP", is an exclusive Cosequin formulation with DOUBLE the amount of glucosamine (7200mg) and a full dose of MSM (10,000mg) in addition to the normal amount of Cosequin’s proprietary low molecular weight chondroitin sulfate. The target market will be competitive horses in their prime. According to SmartPak, the price will be $49.95; recommended dose is one 21-gram scoop per day per horse. The new formula will be available exclusively from SmartPak. By the way, SmartPak Equine was recently recognized in Inc. Magazine as the 106th fastest-growing private business in America of 2005! In the Consumer Products category, SmartPak was the 6th fastest growing firm in the country. With a growth rate of 868 percent in the last three years, SmartPak has achieved a recognition never before attained by a business in the horse industry. This information was provided in a news release. At the British Equine Veterinary Association Conference in England earlier this month, Equinalysis announced that Robert "Bob" Colborne PhD of the University of Bristol (UK) has joined the firm as Advisor on Equine Biomechanics. He is currently program director of the equine science program at Bristol. Bob is widely published in the area of joint mechanics and gait energetics in horses, dogs and humans and was part of the ICEL conference at Michigan State in 2004, where many Hoofcare & Lameness subscribers met him. 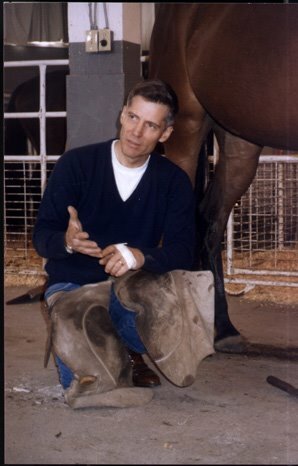 He was an author with Hilary Clayton of the paper "Net joint moments and joint powers in horses with superficial digital flexor tendinitis", published in the American Journal of Veterinary Research. Bob's role at Equinalysis will be to provide experience to Equinalysis in the continued development of its practices and procedures as well as consult with business partners, horse owners and insurance companies. Bob will advise users of the Equinalysis system on methods of data capture and analysis to ensure standardisation of practice, and to optimise the information yielded by a clinical gait analysis. His biomechanics background will compliment the firm's existing veterinary and farriery expertise from leading practitioners John McEwen and Haydn Price, respectively. To learn more about Bob Colborne, visit http://www.bris.ac.uk/Depts/Anatomy/about/staff/Colbourne.htm. 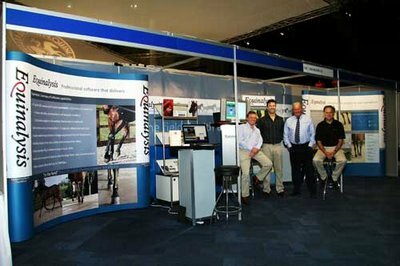 Photo: Equinalysis trade stand at BEVA Congress in September. Principals include farrier Haydn Price, veterinary advisor John McEwen, and human sportsmedicine doctor John Davies. Biomechanics expert Bob Colborne of the University of Bristol has now joined the team. News about Mr. Edward Martin is sparse, but thanks to farrier Jean Meneley of Nevada, we do receive occasional reports. For those who don't know him, Edward Martin is the senior statesman of the worldwide farrier industry and a friend to all in the horseshoeing and blacksmithing worlds. Among Edward's many accomplishments and honors include the MBE, "Member of the British Empire", awarded by the Queen for his services to farriery. I could do a blog just about Edward! Edward is still quite weak from the complications of Parkinson's disease, but thanks to the efforts of his sister, Jane, is still able to live at home in the little village of Closeburn in the Scottish borders district. Edward enjoys hearing from old friends, so please write to him. The fact that you may not receive a response does not lessen the value of your effort in writing to him. Edward's neighborhood is buzzing today! Former British Olympic event rider Karen Dixon is a neighbor of Edward's, and I believe one of his former clients, as well. According to a report received from Horse & Hound (UK magazine) today, Karen and her husband Andrew have just announced plans to build the largest equestrian center in all the United Kingdom, at a cost of 30 million pounds...somewhere around $65 million. In addition to stabling, arenas, and a cross country course, the plan also calls for a village, presumably with an equestrian theme. The location is the town of Lockerbie, site of the horrific Pan Am aircraft bombing about ten years ago, and just up the road from Edward's village. With my tongue set firmly in my cheek, I can't help but wonder if it will be called "The Robert Burns Equestrian Center", after the area's beloved native poet. Here's a PS from Horse & Hound that I thought was interesting: "The development trend comes on the back of a recent British Equestrian Trade Association (BETA) survey which found the number of people riding in Britain has nearly doubled from 2.4m in 1999 to 4.3m in 2006." Those are numbers that you could take to the bank. In an interview in the Philadelphia Inquirer this weekend, owner Gretchen Jackson reported that she expects half of the donations to the Barbaro Fund at the University of Pennsylvania's New Bolton Center will go to laminitis research. "Isn't that nice?" you may be musing..."Bring me some real news!" But wait...generous people have already donated more than $1.25 million to the fund, which means that roughly $600,000 will go to research. But whose research? Chances are, the funds will stay right at New Bolton Center, where a laminitis research initiative has been on the wish list anyway. Here's a quote lifted from the article: One of her (Gretchen Jackson, owner of Babaro) top priorities, she said, is New Bolton's Barbaro Fund, which has received 1,500 contributions totaling $1,225,000. Jackson said half the fund is slated to go for laminitis research, in the grandest-scale attempt yet to eradicate the disease. She's had a conversation with Secretariat's owner, Penny Chenery, about the disease, because Secretariat died from it. In the photo: jockey Edgar Prado visiting with Barbaro and surgeon Dean Richardson on September 19. Photo by Sabina Louise Pierce/University of Pennsylvania. The Associated Press reported this afternoon that the Tennessee Walking Horse Breeders and Exhibitors Association has organized a last-minute championship show for Thanksgiving weekend. The news was first reported in, oddly enough, the International Herald Tribune. One can only imagine what people in Paris and Prague and Stockholm thought of the report. Only three of nine finalist horses at the recent Tennessee Walking Horse Celebration in Shelbyville, Tennessee were allowed to compete; the other six were turned down by USDA veterinarians and inspectors, who said that their inspections found that the horses' feet or pasterns showed signs of "soring" and were in violation of the Horse Protection Act. The three horses that did pass inspection never made it into the ring because an angry owner of a disqualified horse offered to pay them not to go in. Earlier in the show, classes had been cancelled for more than 24 hours after disagreements between trainers and inspectors erupted. Called the Tennessee Walking Horse Invitational, the new show will be held at the Tennessee Miller Stadium, which I think is in Nashville; it will have 50 classes and a purse for the grand champion of $15,000. Horses must first pass inspection before they can compete. Check the archives for August 2006 to read more about the fireworks at the Celebration. According to a report posted on www.tennessean.com, the 42nd Annual Kentucky Celebration Tennessee Walking Horse Show, which was to have been held this week, has been cancelled. To quote tennessean.com: "Jerry Hoskins, a member of the board of the Show, said the decision to call off the show was based on what organizers believed to be unfair and inconsistent inspections by federal officials. "We decided it's in the best interest of trainers and owners to not even try to show," said Hoskins of Liberty, Kentucky, where the show was to be held for the first time. "We do feel like the USDA would be very hard on us." A two-day workshop concerning the safety and soundness of the Thoroughbred racehorse, will be held on Monday, October 16, and Tuesday, October 17, at Keeneland racecourse in Lexington, Kentucky. Three dozen individuals representing a cross-section of the breeding, racing and veterinary community have agreed to participate in the "Welfare and Safety of the Racehorse Summit", which is sponsored by Grayson-Jockey Club Research Foundation. The first morning session will be open to the public. There is no admission, but a voluntary donation to Grayson-Jockey Club Research Foundation will be accepted. The open session will be followed by a closed round table discussion and subsequent breakout groups. Monday afternoon, each group will give a 30-minute presentation on their ideas. Participants will meet in a closed session again Tuesday to develop and recommend definitive action plans. Summaries should be sent in Word or WordPerfect to khix@jockeyclub.com no later than October 1. To learn more, please visit: http://www.jockeyclub.com/mediaCenter.asp?story=254A Jockey Club press release was used as the primary source of this post. The news is coming in from the British Equine Veterinary Association Congress, which ended yesterday at the National Exhibition Center at Birmingham, England. Hoofcare & Lameness Consulting Editor Dr. Hilary Clayton, McPhail Chair in Sport Horse Lameness at the Michigan State University College of Veterinary Medicine, was a popular speaker. Her lecture "Current Trends in Equine Gait Analysis" was sponsored by Equinalysis and will be summarized here as soon as possible. Our British correspondent, Mark Andrews MRCVS, was at the conference and will provide his usual succinct reports. Carbon fiber heel patches developed at the Royal Veterinary College in England are designed to assist the growth of heel quarters. It looks like a black potato chip and weighs about the same, but researchers at England's Royal Veterinary College believe that this tiny patch will, when applied correctly, aid horses with underrun heels by redirecting the horn tubule growth from the coronet. I first heard about the "Heel Support" at the "Maximizing Equine Performance" conference in England this spring. I've been staring at the handful of samples I brought back ever since. Farrier Peter Day at the RVC helped develop the product, and claims that it can stengthen the wall by 40%. Before you scoff, remember that this is the RVC, home of Alan Wilson's Structure and Locomotion Laboratory, where they have any number of ways to test tensile strength of a product or the wall. Wilson's own farrier (and PhD candidate) Chris Pardoe showed me the product. 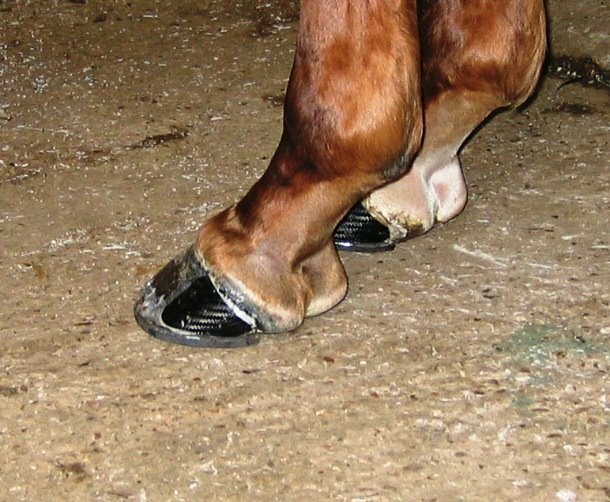 From a press release about the product: "The prevalence (of collapsed heels) is so high in Thoroughbreds (reportedly affecting between 52% and 97%) that it can lull individuals into thinking that the condition is a normal hoof variation rather than a serious pathological deviation. Despite its prevalence the condition is notoriously difficult to prevent or treat." Last week I discussed the product with Frank Dugan from Vettec; his company's urethane-based adhesives are used to adhere the patch to the heel below the coronet--placement and adhesion would seem to be key components to success. Frank said that the product's marketing group does not yet have a USA distributor but he was enthusiastic. Since the "chips" are almost weightless, shipping from the UK might not be too expensive. Marketing is currently through VetCell, the firm that is also marketing the RVC's bone-marrow stem-cell therapy for tendon injuries. The British racehorse Chancellor recently made a victorious comeback to the track wearing the patches; his foot is shown in the photo. No, I can't explain the steel shoes, perhaps they use a thicker training plate in the UK? If the sea gulls haven't stolen the samples, I will send some to interested farriers or vets to try. Please contact Fran at the Hoofcare Publishing office during business hours: 978 281 3222. In the past, we have written articles about carriage horses slipping on the pavement and, in 2004, about a carriage horse in New York that was electrocuted through its steel horseshoes. Thanks to the Ritz Carlton for coming to the horse's rescue with what was probably a very expensive rug. There's something tragically poetic about this story. Have you seen one of these before? Probably not. You're looking at the prototype of a new glue-on shoe made entirely of polyurethane. What makes it different from most plastic shoes is that these are made with a steel core, so the shoe is somewhere shapeable, and it has a steel toe grab. The shoes are made in molds. 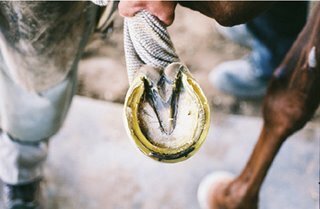 This shoe is the brainchild of Florida-to-New-York farrier Curtis Burns. I ran into him at Keeneland back in April, and then again at Saratoga. The shoes are underneath some very good horses--this is the foot of a top stakes-winning filly. People talk about the eternal quest for a better mousetrap...for me, the quest is for a better horseshoe. And as long as there are farriers out there, they will never stop trying to come up with a better design and a safer way to keep a horse's feet in perpetual motion. Curtis deserves a big pat on the back, as does his wife Diane, who does a lot of the molding. I think you'll all be hearing a lot more from them, but for now it is one horse at a time. Will there be a special shoe design needed for the new Polytrack surfaces being installed at the California tracks and Woodbine in Ontario, among others? I'm sure there is one on a drawing board somewhere right now! Client education takes a big step forward this month as we begin marketing the new dvd "Get Your Horse Sound" from California farrier John Suttle. In just 38 minutes, John does a remarkable job of explaining the lever theory of hoof construction/function and how underrun heels compromise a horse's ability to bear weight and lead an athletic life. Not everyone will agree with John's "materialistic" solutions (Vettec should have bankrolled this dvd, given the heavy use of their adhesive hoof reconstruction materials in the shoeing) but the explanations are clear and the examples are good. I think John has a great career ahead of him in educating owners (as well as vets and farriers) because his low-key approach (he even wears a Mr. Rogers-type cardigan) is sincere and direct. And, he doesn't have anything to sell (except the dvd). It's like a breath of fresh air. Click here to watch a simple preview. To place an order for the dvd, please call, fax or email the Hoofcare office with your name, address, and Visa/MC information. This dvd is made for North American format dvd players; if you are in another hemisphere, you'll need a universal player and even then, it may not work. Cost is $30 per dvd plus $5 post in USA. In an interview in The Thoroughbred Times, Barbaro's trainer Michael Matz said that he was still concerned with the possibility of laminitis in the front feet. We all know that spring is a dangerous time for laminitis but it is important to remember that the second flush of grass in autumn can be just as risky. We get numerous calls during the autumn from worried owners wanting to know what they can safely feed laminitis prone ponies and how to manage those that have suffered a further attack. Laminitis is second only to colic as the most common reason for presenting a horse for veterinary treatment. In a recent study in the UK it was found that over 1 in 10 horses were affected by laminitis with a greater prevalence during times of high grass growth. Work completed in the USA has also found that an overload of lush grass or cereals ("grain") is the cause of laminitis in more than 50% of the cases reported. 5. Don’t feed high cereal (grain) mixes as these can increase the risk of another attack. The American Farrier's Association (AFA) held its mid-year board of directors meeting in Albuquerque, New Mexico this weekend. Hoofcare & Lameness did not attend but we have received a summary of events from our colleague Nancy Zwicker, editor of Farrier News in Washington State (and an AFA committee chairman). More news was provided by AFA acting executive director Mike Nolan. According to Nancy, a general membership session was held on Friday night to ask AFA President Dave Ferguson questions about how the conversation was handled (and why) when former executive director Bryan Quinsey left the employment of the AFA. In business matters, more than 30 proposed by-law changes were presented for vote. The big one, the re-organization of the Board to be representative of the paying membership rather than of individual chapters received more "yay" than "nay" votes, but was three votes short of the majority needed to be enacted. However, the change in the executive board, which adds a president-elect, gives the past president a vote, eliminates the position of secretary, etc. did pass. The World Championship Blacksmiths' contest management company was approved as a chapter of the AFA. Greg Burdette of Washington state has replaced Tim Quinn as the Board's representative to the Executive Committee. However, the new makeup of the executive committee does not include a board rep, so they will have to find a workaround for that problem. A new liability insurance policy for chapter organizations was unveiled and was well-received, according to Nancy. Watch for more news to be released from the AFA and (no doubt) corrections to this news. Thanks to Nancy Zwicker, who is chair of the membership benefits committee of the AFA, for her phone reports and thanks to Mike Nolan for verifying the facts and setting me straight. 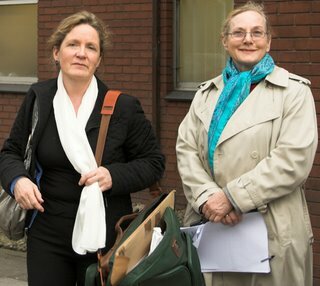 Mary Jo Kowalski (left) and Dr. Hiltrud Strasser (right) at a hearing in England. A Suffolk (Great Britain) woman, convicted on cruelty charges linked to the “mutilation” of her pony's feet by “dogmatic adherence” to the Strasser barefoot method, has launched an appeal. Mary Jo Kowalski was banned last week (30 August) from keeping equines for one year, sentenced to 100 hours community service and ordered to pay £10,000 towards costs. As welfare groups expressed disappointment at the leniency of the sentence, Mrs. Kowalski lodged an appeal before Ipswich Magistrates Court. The conviction against the student of the Strasser method, who was in e-mail contact with its German founder Dr Hiltrud Strasser marks the second case of its kind this year. Dr Strasser was called as a trial witness. Both prosecutions involved the Strasser technique, casting grave concern on the unregulated practice of radical trimming. Britain's Farriers Registration Council (FRC) secretary Miles Williamson-Noble said the question of throwing a national safety net over the practice of trimming, which falls outside the Farriers (Registration) Act 1975, was under discussion with the National Equine Welfare Council and British Equine Veterinary Association. These talks could lead to voluntary regulation, a national code of practice and accredited training. Mr Williamson-Noble said radical trimming caused most concern as it was often done to treat conditions such as laminitis, as was the case in the two convictions. In the first case, Warwickshire yard (boarding stable) owner Fiona Dean, 43, was fined £1,500 and ordered to pay another £1,500 in costs, for causing unnecessary suffering to a horse in her care by using the Strasser method. “Anyone who takes a sound horse and trims its feet until it is in extreme pain is not concerned with that horse's welfare,” said Mr Williamson-Noble. Evidence from Mrs Kowalski's trial suggested she had become “mesmerised” by the teachings of Dr Strasser. The prosecution was mounted after the RSPCA seized her pony Brambles in July 2004. The mare was found with “mutilated hooves”, walking with crossed legs, and barely able to move. She had to be put down. According to the RSPCA, Brambles was suffering from chronic laminitis affecting both front feet, but instead of calling a vet, Mrs Kowalski rasped and trimmed the pony's hooves to the point of “mutilation”. Dr Strasser testified that, based on photographs, there was nothing to show trimming was excessive and that, merely, Brambles's hooves had “a good trim”. She said a sick pony required fresh air, not painkillers. Photo courtesy of International League for the Protection of Horses; Convicted trimmer Kowalski (left) and Hiltrud Strasser DVM, right at British court. This story was slightly edited for style and length considerations. The decision to cancel the final class of the 2006 Tennessee Walking Horse National Celebration was based upon the best information available to show management from the inspection area and from law enforcement officials. Tennessee Highway Patrol officers informed Celebration officials that they were confident they could protect the safety of the people working in the inspection area but did not have the manpower available to assure the health and safety of the 26,000 spectators, exhibitors and horses. When show officials entered the warm-up area to check if the three entries eligible for the class were going to show, they were unable to reach the horses. They were almost immediately confronted by a crowd of approximately 150 people who demanded that all horses be allowed to show and were told that the three entries eligible to show would not be going into the ring. As the crowd continued to build, law enforcement officers escorted the show officials from the warm-up area and took them to the Celebration Administrative offices and the announcement was made that the class would not take place. The Celebration deeply regrets having to cancel our World Grand Championship class for the first time in 68 years but we were unwilling to compromise the health and safety of our fans, horses, personnel and exhibitors. We extend our deepest sympathy to all of those affected by this difficult decision and thank you for your continued support of our show during this most challenging season for the entire industry. One can only imagine the reaction of the crowd at the Walking Horse Celebration on Saturday night (September 2, 2006) when it was announced that there would be no grand champion class after ten days of showing. The world's largest show for Tennessee Walking Horses had already been shut down for more than 28 hours the week before following a confrontation between USDA inspectors and trainers. The show had resumed, but the inspectors had the last call, so to speak, when inspectors rejected the majority of finalists for the grand championship on the grounds that they could not pass federally-mandated regulations defining how to identify a horse that has been made "sore" with chemicals or treatment to the pastern and/or pressure shoeing. The three horses that did pass inspection were not shown. Whether this was voluntary or they were bribed is possibly a bigger concern right now than the condition of the horses themselves. According to the Walking Horse Report newspaper, several trainers of horses that had been declared sore then went into a schooling arena and had a mock show for assembled fans. One trainer said he took his horse directly back to the barn because he feared for his safety. Show ring officials had to be escorted by law enforcement, according to the WHR. Reports from The Tennessean and Walking Horse Report were used to compile this summary. The New York Times even reported on this embarrassing event in the horse show world. The American Association of Equine Practitioners (AAEP) will host the 7th Annual Healthy Horses Workshop on December 2 in San Antonio, Texas. Held in conjunction with the AAEP's annual veterinary conference, the AAEP Healthy Horses Workshop will feature educational seminars and demonstrations designed specifically for horse owners and enthusiasts. Colic: What it Means to You & Your Horse Dr . David Freeman, Gainesville, Fla.
Equine Reproduction: From Conception to Birth Dr. Ben Espy, San Antonio, Texas. Joint Disease & Lameness in the Horse: Why Does it Happen & What Can Be Done About It? Dr. James Casey, Laurel, Md. Managing the Health & Well-Being of Your Aging or Geriatric Horse Dr . Nancy Loving, Boulder, Colo.
First Aid Tips for the Horse Owner (live horse demonstration) Dr. Mark Fitch, Boulder, Colo.
"The Problem Horse" (live horse demonstration) Dr . Mark Fitch, Boulder, Colo. and John Lyons, Parachute, Colo.
New this year is an afternoon live horse demonstration beginning at 1:45 p.m. which will feature clinician Dr. Mark Fitch and world-renowned trainer John Lyons (sponsored by Nutrena). They will demonstrate hands-on techniques including loading, handling the feet, saddling and more. AAEP's Healthy Horses Workshop will take place from 7:30 a.m. to 6:00 p.m. at the Freeman Coliseum Grounds near downtown San Antonio, Texas. The pre-registration fee before November 6th is $75; after November 6th, please register on-site (on-site registration fee will be $90; lunch will be provided with the cost of registration). To register, visit www.myHorseMatters.com and click on the Healthy Horses Workshop banner or call the AAEP office at (800) 443-0177 (8:30 a.m. to 5 p.m. EST). Note: the information above is from the AAEP and slightly edited to fit HoofBlog style. It is important to note that this event takes place the day BEFORE the AAEP convention really opens, so you might need to adjust your travel plans to attend this event. Saturday at the AAEP Convention is a day for registrations, committee/forum meetings, and for those of us in the shameless commerce sector, setting up the trade show and tracking down lost shipments. The trade show will not be open that day. As a member of the press corps, I would love to be everywhere at once and will no doubt try. There's a nice sign to welcome you to Saraoga, but there isn't one that says good-bye as you leave town. Perhaps that's because no one ever really leaves. Even if they don't come back the next summer they plan to, someday. From the small print in The Saratoga Special recently: "We're in good shape, for the shape we're in." That's a quote attributed to David Mullins, Thoroughbred breeder and yearling consignor. I'll have to remember that one. The "Hoofcare@Saratoga" tour is playing like a tv-reality show so far. In other words, nothing is going according to the script! We've had one event cancelled because of 100 degree heat (even the racetrack was shut down, it was so hot)...and a cancelled speaker another week...a speeding ticket...a handicapped dog in the back seat...a car accident on the Mass Pike...and yet I know in another week or so when I am back in Massachusetts, those won't be the things I remember. 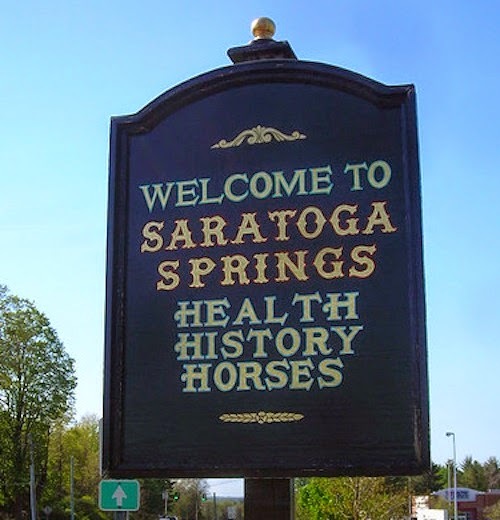 I'll remember the thrill of seeing people--dozens of people who've never heard of Hoofcare & Lameness before that night--marching into Dr. Don Walsh's "Hoofcare@Saratoga" evening on laminitis. Yes, they really showed up, Hoofcare@Saratoga was a reality! I'll remember driving down Nelson Avenue and peeking through the hedges for a glimpse of Stonerside, the former Greentree Stables training track and barns. If I was to pick my favorite horse architecture in the world, I think Stonerside/Greentree would be it. But Bill Mott moved to new quarters this year, and I think Godolphin Racing has taken over. Someone has...and they've put up big "No Trespassing" signs at the gates. How sad. I don't remember Stonerside ever being overrun with tourists. I'll remember going to the farrier shop at the Skidmore Equestrian Center at midnight with Cornell farrier Michael Wildenstein and Skidmore farrier Jim Santore to see one of the sweetest horseshoeing shops in the land. I'll be back with a load of cameras one day to photograph Jim in this shop. I'll remember a fabulous lunch way up in the turf club with racetrack legend Ada Gates, who was visiting from Los Angeles. I'll remember watching Dianne Volz trying to do therapy on Flower Alley and wondering why she's not covered with bite marks (or worse). I'll remember an August with almost perfect weather (once that horrific first week of stifling heat was over). I'll remember the palpable emotion in the air at the dedication of the farriers' memorial behind the Oklahoma training track. And how surprised I was when Pat Day popped out of a golf cart and led everyone in prayer. He said that horseshoers had saved his life by keeping the horses safe. I'd not thought of it that way. I'll remember the farmers' market in Saratoga and how nice it was to fill my car up with fresh vegetables for the long drive home. I'll remember the easy-going attitude of everyone at the Parting and the bartenders' sincere attempts to try to understand just what laminitis is. I'll remember the first time I entered the state park in Saratoga; I hadn't been there since I was in high school. All those trees. The architecture. The gardens. And the Gideon Putnam hotel, such a perfect place to stay. If only they allowed dogs. I'll remember the school-girl thrill I got the first time I saw Funny Cide and Showing Up, just lounging in their stalls in Barclay Tagg's meticulous shedrow. I'll remember a stolen hour when I was able to browse through the horse books at the Lyrical Ballad bookstore on Phila Street, with Don and Diana Walsh. That has to be one of my favorite places on earth. What a treat. I'll remember the horseshoers, especially the parade of them through Butch Colbert's farrier supply trailer every Wednesday morning. So many new friends. I never did get to wander through the shops on Broadway...or eat at Hattie's Chicken Shack...and I still haven't been to Yaddo. I suppose if I'd done it all and seen it all, there would be no reason to come back and I want to be very sure I have plenty of reasons to return to Saratoga next August. We have great memories of this year to carry around in our hearts like so many talismen against change. There is always that feeling that even though it has been there for 250 years, this place is just too good to be true. It can't possibly last...but I sure hope it does. Doug Butler, PhD, FWCF will open a horseshoeing school in Crawford, Nebraska this fall. Teaching alongside Dr. Butler will be two of his sons, Jacob and Peter. "Butler Professional Farrier School" will also offer a certification program for its students to progress from level to level, and will offer classes from beginning to advanced as well as personalized graduate-level training.